Bill Fenner sends out a periodic automated email to the freebsd-ports mailing list with links to ports that do not build: http://people.freebsd.org/~fenner/errorlogs/. This is a useful page for any port maintainer to visit periodically to make sure all of his/her ports are humming along. If a port remainis unbuildable for too long, portmgr will likely mark it BROKEN after a while, and if it stays BROKEN too long, it will be removed from the tree. Fixing a broken port may be as easy as correcting a download URL or as complex as patching source code so it builds correctly on the AMD64 platform. There are many different ways to get your feet wet, so I encourage you to check some of the broken build log files and see if you can fix, and possibly adopt, one of these ports! There is a huge variety of software to explore in the ports tree, and if you’re interested in maintaining one or more ports, I suggest looking for something you’ve already used in the past or a piece of software in your area of interest. For instance, there are a number of astronomy and biology-related ports that could use some help! Another great place to find ports that need some help, be it maintainership or submitting PRs to fix them, is the pointyhat build cluster status page: http://pointyhat.freebsd.org/errorlogs/. If you’re just getting your feet wet and don’t know where to start, subscribe to the freebsd-ports mailing list or browse its archives. You’ll find a lot of questions and solutions to common problems as you learn more about the ports infrastructure. To prepare for the upcoming inaugural International FreeBSD Adopt-A-Port Day on June 15th, 2009, I am publishing some interesting (???) statistics about the FreeBSD ports tree. First up (cue the violins): The most unloved FreeBSD port! This port has been a workhorse since the year 1996, back in the days before the Internet you now know, when a fast connection was 56k and we often disabled image loading in our browsers to speed up the browser! Those days, there were fewer than 500 ports in the tree, a far cry from the 20,000+ we now enjoy. And now, I give you (drumroll, please)…. The CVS log shows that this port has been unmaintained since 17-Nov-96, so it’s been nearly 13 years that ghostview has been wandering aimlessly through the tree, waiting for someone to adopt her/him/it. The ghostview port won’t require a lot of care and feeding, but if a new upstream version is released, the port would like a FreeBSD maintainer that will submit a PR to keep it in sync. So, wouldn’t you like to help a port regain its standing in the tree and become all that it can be and more? Contact me at glarkin@FreeBSD.org to get involved and help out! Just for fun, let’s designate June 15th as the inaugural International FreeBSD Adopt-A-Port Day for 2009! My colleague and co-mentor to Alexander Logvinov, Thomas Abthorpe, posted to the freebsd-ports mailing list in March looking for folks to adopt unmaintained FreeBSD ports and keep them up to date. After a port is added to the tree, a maintainer keeps track of upstream package releases, updates the port to track the new version, adds any needed configuration options and makes sure that it builds and installs on the FreeBSD supported platforms. As payback, you’ll often hear from folks using your port, whether sending thanks, enhancement requests or the occasional bug report! Since submitting that first PR, I have created a number of new ports for tools used at SourceHosting.net or just in my areas of interest. I have adopted many as well. Most unmaintained ports are very undemanding and just need some minor TLC! It’s a great way to support a project that has contributed directly to the success of my Real Job. Have any questions or guidance? Email me at glarkin@FreeBSD.org, follow me on Twitter or comment here. We’d love to work with you! Once again, I bring you another useful Subversion-related tool. This time, I recently discovered a Trac plugin named RevtreePlugin. If you want to display your Subversion branches and revisions graphically inside of Trac, this is the plugin for you! You will be presented with some options to enable some display enhancers. Make sure to enable the mergeinfo enhancer, and you’ll see some interesting graphs if you’ve been merging a lot. A while back, I hooked up my CodeIgniter sample application to a MySQL database. That was easy, and now I’ll show how to move your presentation code into separate view files, instead of echo’ing HTML from inside a controller file. <p>There are <?php echo $num_users; ?> users defined in the database. Ok, this all seems to be pretty easy. Of course, there’s a bunch more functionality in the CodeIgniter framework, but I think what I’ll do for my next post is shift gears and go through the same basic exercises using CakePHP, Prado, and the Zend Framework. It will be interesting to see if there’s any similarity to the way the classic “Hello, world.” program varies in complexity based on implementation language! I’ve submitted some new FreeBSD port upgrades over the past week, including new support for CodeIgniter 1.6.1. In addition to the version bump of the upstream distribution, I also added some new bits to allow customization of certain CI files. The port is also careful to avoid removing those modified files when a new port upgrade comes along. The reference for how to handle user-configurable files installed as part of a port can be found in the excellent FreeBSD Porter’s Handbook in the Configuration Files section. What this does is install a reference copy of each file (*.sample) that is not expected to be edited by the user. The actual file that CodeIgniter uses to render pages (no .sample suffix) is user-configurable as needed. This concept needs to be implemented in several of the other ports that I maintain, including CakePHP and Prado. If anyone has a list of files that are user-configurable in each of those frameworks, please send it along! Ok, let’s proceed to install the various PHP frameworks that we’ll use to create a sample application. Hmm, what is that screen for? The FreeBSD ports collection has a robust infrastructure for configuring software applications prior to installation. In this case, CakePHP works with multiple different database backends, so the port writer (i.e. me) decided to provide options so the prerequisite bits are installed before the port proper. Looking at the options provided here, the first one named “PROD” determines the way that the Apache web server is configured for CakePHP. If this is a production server, this option should be selected so navigating to “http://<servername>/” displays the CakePHP welcome page. Since I am installing multiple frameworks on the same machine, I’ll leave this option unchecked. That way, each framework welcome page will be found at “http://<servername>/<frameworkname>/”. 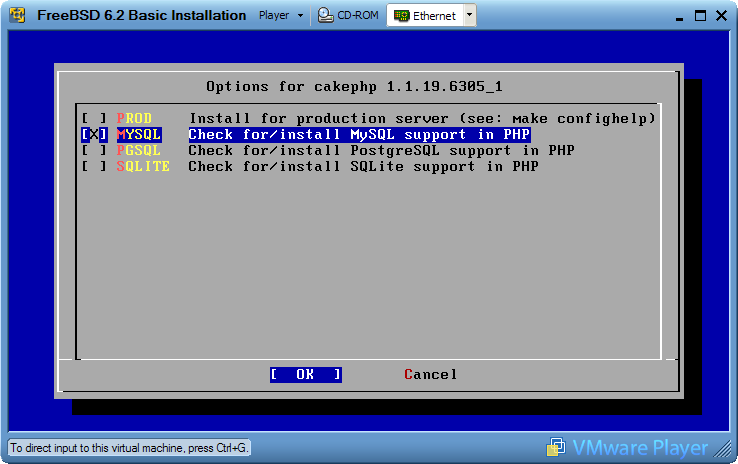 This helps us get a working PHP installation that supports CakePHP out of the box. 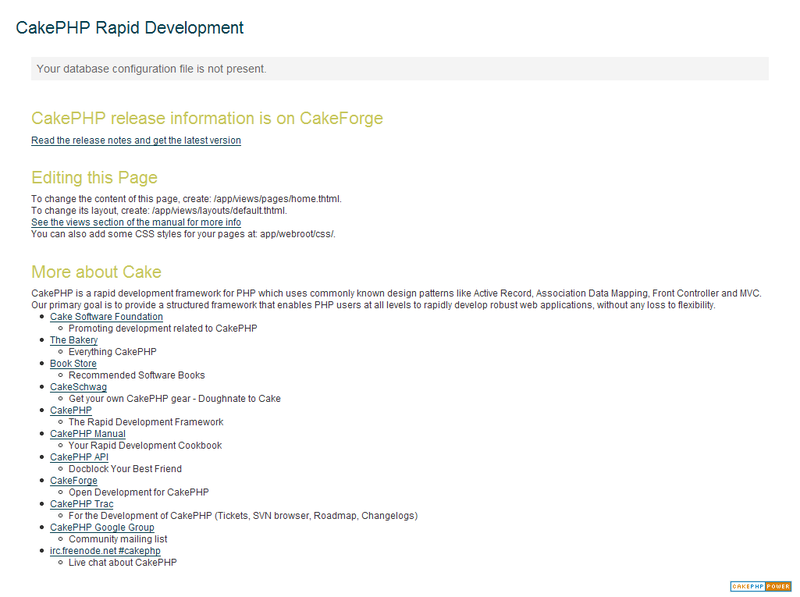 That gives me 192.168.95.128, so here’s the URL where I should find the CakePHP default page: http://192.168.95.128/cakephp/. The address will likely be different for you. If you have any trouble, write in with comments and feedback.